The crimson flag finally arrived home. 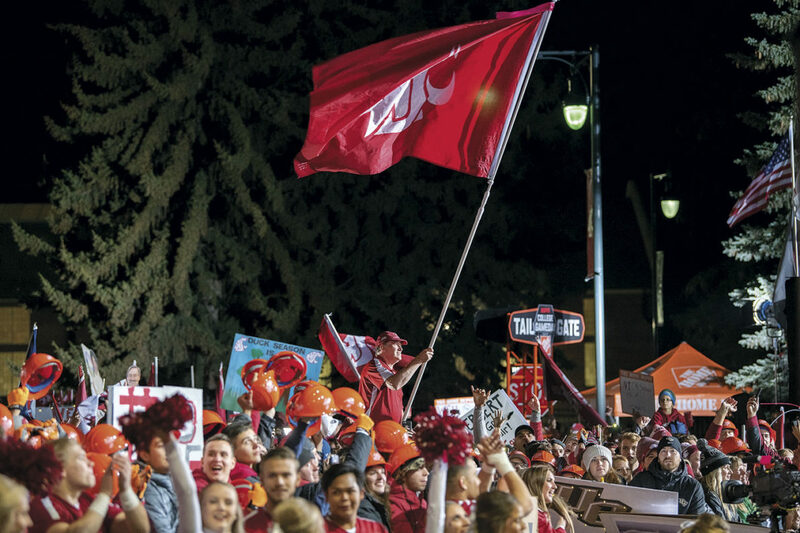 After 15 years of faithfully waving the Cougar flag on ESPN’s College GameDay, the whole nation saw the symbol of Cougar pride at the first airing of the popular football pregame TV show in Pullman on October 20, 2018. Pounds’s motivation for displaying the hand-sewn flag was simple: to display his school spirit. His infectious joy was picked up by other WSU alumni and friends who kept displaying the flag week after week. The streak became a tradition and an integral part of the show. Now the Ol’ Crimson Booster Club and flag manager CJ McCoy ’98 keep up that tradition, ensuring that a Cougar flag makes it to every airing of College GameDay. That included WSU’s home debut on the show last October, as the football team had cracked the top ten and faced the University of Oregon Ducks at a sold-out Martin Stadium. Behind the leadership of Gardner Minshew II, the “Mississippi Mustache,” the Cougs took the win, on their way to a school record 11-win season. Some may think the Ol’ Crimson tradition is a little crazy. But any Coug fan will tell you it’s no surprise that alumni and fans across the country picked up Pounds’s idea and ran with it. “There’s a deep sense of joy in being a Coug,” explains Pounds.